High in the Rocky Mountains of southwest Colorado, hot sulfur springs bubble to the surface. The small resort town of Pagosa Springs sprung from these. With an elevation above 7000 feet, nights are cool and winters are long. The hot springs make a pleasant spot to warm up. While the famous ski areas further to the north are popular and thick with tourists, the highway 160 corridor feels more authentic. This route includes the Great Sand Dunes, Pagosa Springs, Durango, and Mesa Verde. 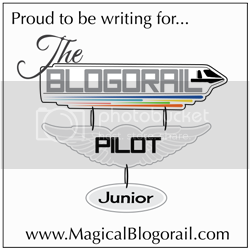 It really should be on the plans of many more travelers. 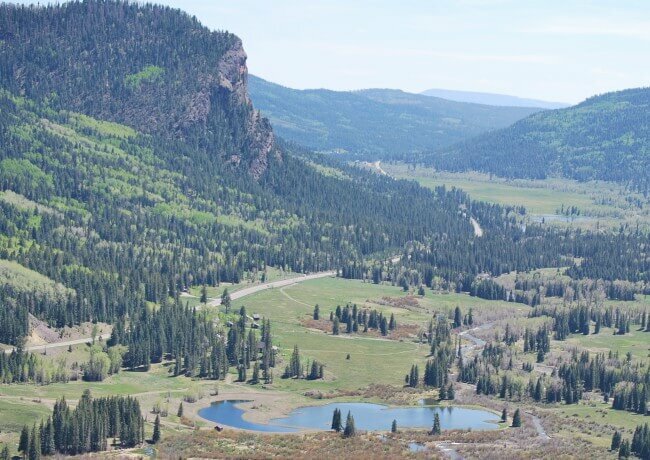 Not long after crossing west over the continental divide, highway 160 runs through the middle of the small, mountain town of Pagosa Springs. We were eager to warm up from the chill of the high elevation. Snow still clung to the high mountain passes. Arriving at The Springs Resort & Spa, the pungent smell of sulfur was thick in the air. Steam rose from behind the lobby. 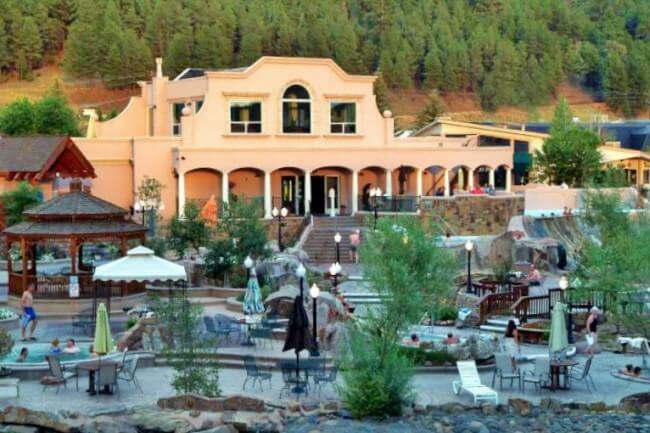 There are three hot springs resorts in Pagosa Springs. 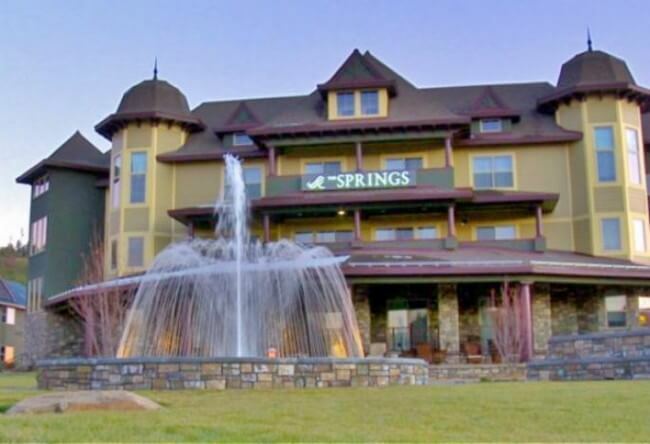 By far the largest, with the most pools and the “mother spring” is The Springs Resort & Spa. We checked into our room adjacent to the lobby in the Spring Inn Motel building. It was damp and musty smelling. Returning to the front the desk, we requested another room. Our next room was in a slightly removed, much newer building called the Ecoluxe Springs. This room smelled and felt fresh and comfortable. The entire Ecoluxe hotel was beautiful. The Springs Resort & Spa has 23 pools from which to choose. You do not have to have a room here to enjoy the pools. You can pay to visit the spas. We spoke with people who were camping, staying at other motels, and who had driven up from Durango. Unlimited access to the pools and springs comes with staying on site, though. Eager to relax our muscles, we donned our bathing suits and the provided super-soft robes. The evening was quite chilly and we scurried the short distance to the pools. Pool names and temperatures are posted. Pool temps range from a warm 86 degrees in the Crick tub to an intensely hot 112 in the Paradise pool. Brave souls could also take a dip in the cold San Juan River at the back of the pools: 48 degrees. We had a wonderful, relaxing time switching from pool to pool. The robes and the heat from the springs kept us comfortable walking around in the cool mountain air. In the summer, rafting and tubing down the San Juan River through the middle of Pagosa Springs is popular. The water stays cool, though. Across the road from The Springs Resort & Spa you will find the wonderful Reservoir Hill Park. I took the chance to explore the park on my morning run. Single and double track trails wind all over the hill for runners, hikers, and mountain bikers. The pine forests and stunning views from the summits highlighted my morning. A wonder disc (frisbee) golf course covers the lower portion of the park. In the winter, cross country skiers enjoy further reaches of the park. 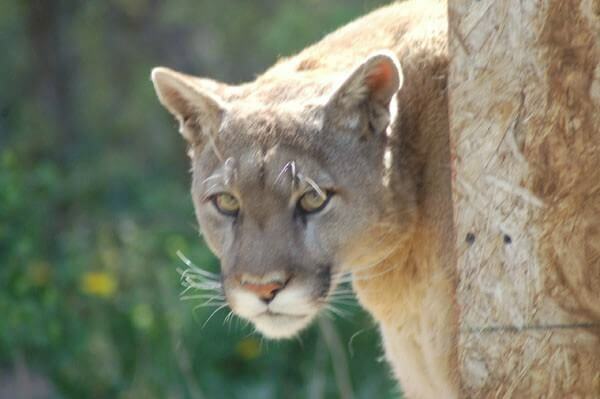 The Rocky Mountain Wildlife Park, a short drive south of town, cares for rescued, mostly native animals. See bears, coyotes, wolves, mountain lions, elk, and more. People who enjoy horseback riding will find miles of trails through the San Juan Forest. Several stables in Pagosa Springs allow those of us without our own horse to enjoy riding, too. 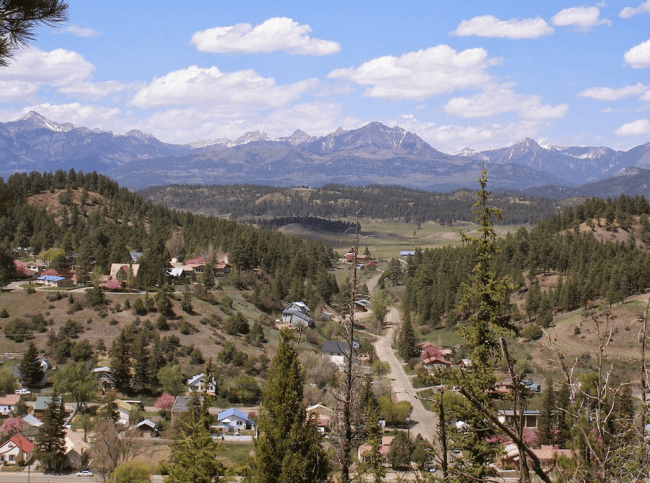 Our family thoroughly enjoyed our brief stay in beautiful Pagosa Springs, Colorado. The scenery is stunning and the hot, sulfur springs are relaxing. When visiting the Colorado Rockies, do not overlook the less touristy southern span. And, make sure to stop by Pagosa Springs. Very engaging photographs. Seems you and family had a great time. Would some day explore wilderness of this mountain region. It is a beautiful area. Pagosa Springs, Great Sand Dunes, and Mesa Verde in Southern Colorado made for great stops as part of trip to the Grand Canyon. I haven’t found many other people, even when we lived in Colorado Springs, who had heard of Pagosa Springs We loved it. Darcee & I drove from Farmington, New Mexico up to Denver and stopped for lunch in Pagosa Springs. What a great town. How much are the day passes for those not staying in the resort? The day passes start at $26 for adults and $14 for children. They go up to $53 with robe, slippers, towel and locker. Not cheap! This make staying at the resort seem like more of a bargain. The Rockies always have a special place in my mind. So much to see, so much to do, summer and winter alike. 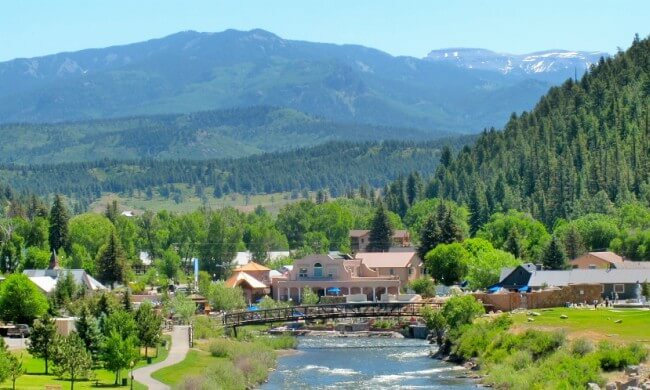 Places like Pagosa Springs just keep the travel list getting longer! I love the Rockies, too. And, I do not even ski! I haven’t been to Colorado yet but I will be going in the next year to check off my bucket list. I had not heard of this resort until reading your post and I’m fascinated! I love a good soak in the springs and this hotel looks like the perfect place. Thanks for sharing! I’ve never heard of Pagosa Springs before. My mom was just telling me the other day that sitting in a natural hot spring was on her bucket list. Sounds like I may have to take her here on a trip! Hot springs are incredibly soothing once you get over the sulfur smell. 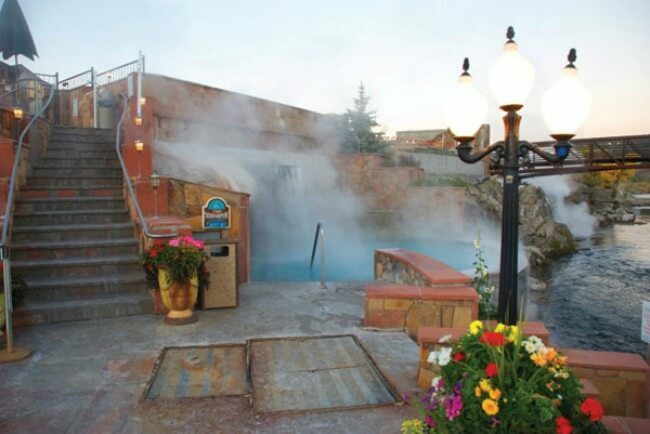 Oh, I’d never heard of Pagosa Springs but love the sound of enjoying natural hot springs in Colorado! I love onsen resorts in Japan, so I know I’d enjoy this all-American version. Good tip on being assertive if allocated a poor room, I think that’s something people should not be scared to do, though a shame the hotel would allocate a room that’s so in need of refurbishment to a guest when they have better rooms available. We were surprised and disappointed about the first room. It was a standard room. The second room was an upgrade to a suite. We were pleased at the upgrade. If all goes to plan Colorado should be one of our stopovers on our trip through the US. 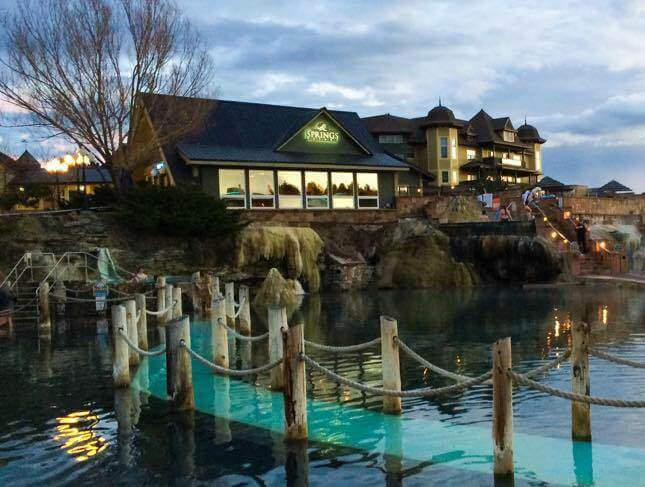 We’ll definitely have to pay Pagosa Springs a visit! Also, I can totally relate to you with the sulfur. We had a very similar experience in Rotarua, NZ. The smell does take some getting used to! Most travelers miss Southern Colorado for the much more hyped northern towns of Aspen, etc.., which are beautiful, too. We hope to someday visit Rotarua, too! I don’t ski so Pagosa Springs Colorado looks like the perfect spot to me in the area. With all those 23 pools and beautiful scenery I would not mind spending a weekend . . . or the whole week! Great discovery, thanks! We do not ski either. I like my ACL and other tendons intact! It really is a nice place and part of a wonderful road trip. Thanks. We love the Rockies and enjoyed The Springs.